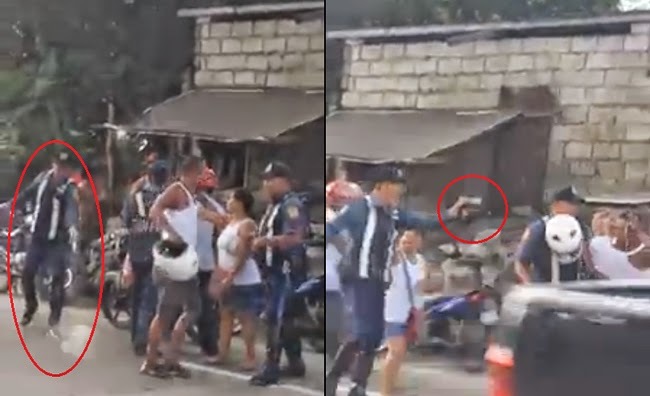 A video version of the now going viral photos of a police allegedly pointing and shooting at a civilian is now also making its rounds over Facebook and YouTube. The video credited to Mark Lorenzo shows the point when the police officer did his ‘warning shot’. Just like the photos, the video added more uproar as many had shared that a warning shot must be pointed upwards and not towards the feet of a civilian. At the beginning of the 34 second video, the stopped motorist and his wife could be heard arguing with the police officers over a ticket that was about to be given to them. The man in white can be seen circling around the motorcycles, holding his white helmet. As he reached the other police officer, the video was unable to show what happened but suddenly the officer took out his gun and pointed at the motorist. He then continued to point his gun at him for a few seconds after firing a shot. The passersby were all surprised and the woman recording the video had cried foul over the ‘warning shot’. Many also commented that the shot was indeed foul because the man was unarmed. Furthermore, some netizens who claimed to be in PNP and military had opined that checkpoints must have a patrol car and a barricade sign saying that it is a checkpoint. They also said that law servants are still human and the motorist might have said or did something to make the officer snap but it is still wrong to fire a service firearm at an unarmed civilian. Netizens are determined to make the video and the photos viral to reach to the media and higher ranking officers.